I decided to start a new thread for this topic as it looks like it might be interesting. 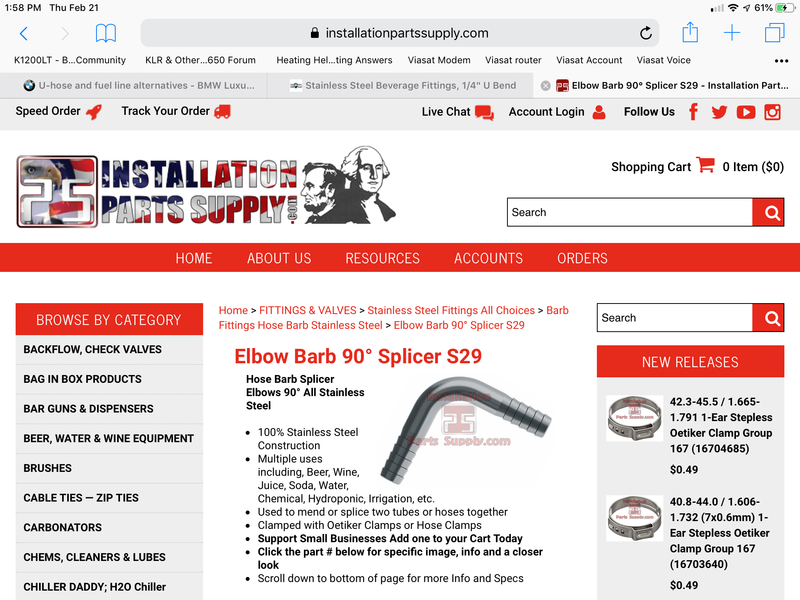 After seeing the SS u-bend at the Nushing web site, I started looking around for other similar bends, 90 in particular. I have yet to find 90s, but I am still looking. 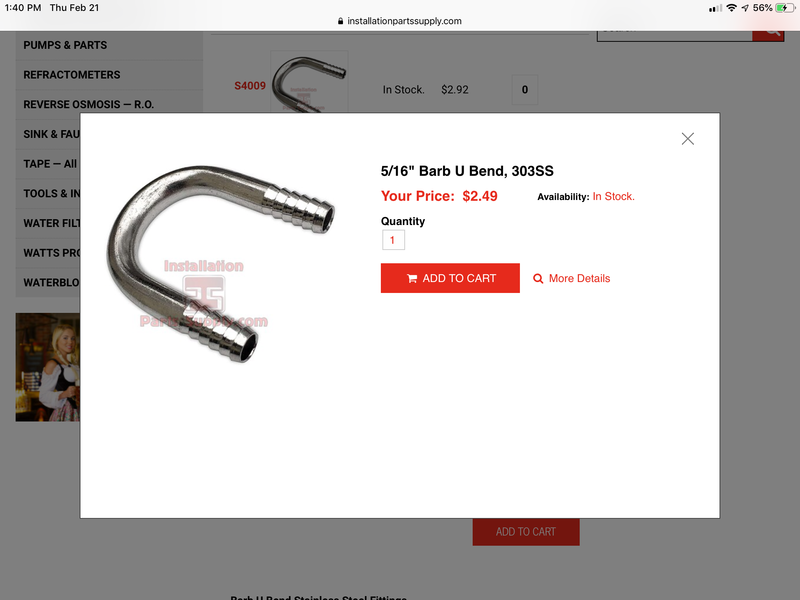 I did find a site with a range of u-bend sizes, including 5/16” at much lower cost than the Nushing part. Although, the Nushing part may include shipping which would likely be an equalizer. I also plan to now check Amazon for these parts now that I have a better description to search on. I found elbows, but none in 5/16” size. I suspect the 3/8” might stress the 8mm hose a little too much. 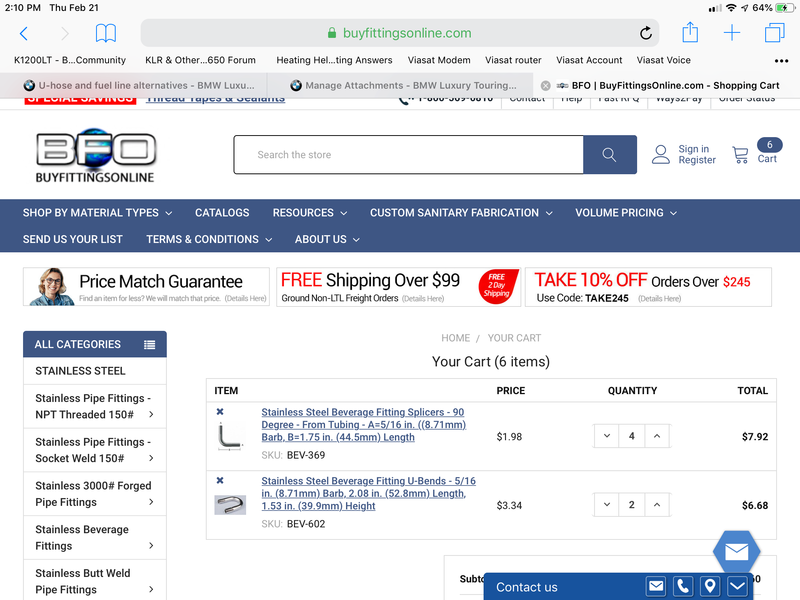 I did check the the Nushing part includes shipping so that probably equalizes the price in quantities of one. The U bend would have to have the right diameter to be useful. If you have yours apart, you can measure what it needs to be. I found a supplier that has 5/16” 90s and 180s. I was going to order a few of each, but found they have a $40 minimum order. Time to visit Amazon and look some more, but wanted to post this here for anyone else who may be interested. I haven’t pulled the pump yet, but will try to remember to measure. I am going to measure the size of the u-bends under the tank also. Is this for your fuel lines at the throttle body points or fuel pump? I thought about using metal once when I first got the RT but someone thought the extra weight might cause repetitive vibration issues so I used the BB kit for four years of flawless running. I thought you had decided the friction losses of a 90 would be negligible give the pressures and short distances in the circuit? I will likely have my fuel tank back on in a couple of days and will take it out for its first test run, will let you know ...however if you aren't afraid of 90s then NAPA has vacuum elbows that are fuel-line rated, they may even have a 45 but not sure I recall that correctly. External hoses from fuel tank to fuel rail. I have the in-tank solution with the EME nylon lines. My concern with friction losses is with the tight 90 fittings that are more readily available, but are designed for gasses rather than liquids (air and vacuum lines). However, these beverage fittings are sweep fittings designed for liquids so they should be perfect. Just not sure I want to buy two dozen of them in order to meet the $40 minimum. Although, that is still less money than ONE SINGLE BMW u hose. If you have friends who homebrew they might help you meet the minimum. True. I will probably run the bulk hose first and see how things go. It would be fairly easy to retrofit the metal bends later if they prove necessary. Just have to remove the side panels and I pretty much have that down to a science. I've had a few folks ask about photos. Here's a couple of the u-bend from nushings.com on my new to me LT. I made my U bend out of brake line. 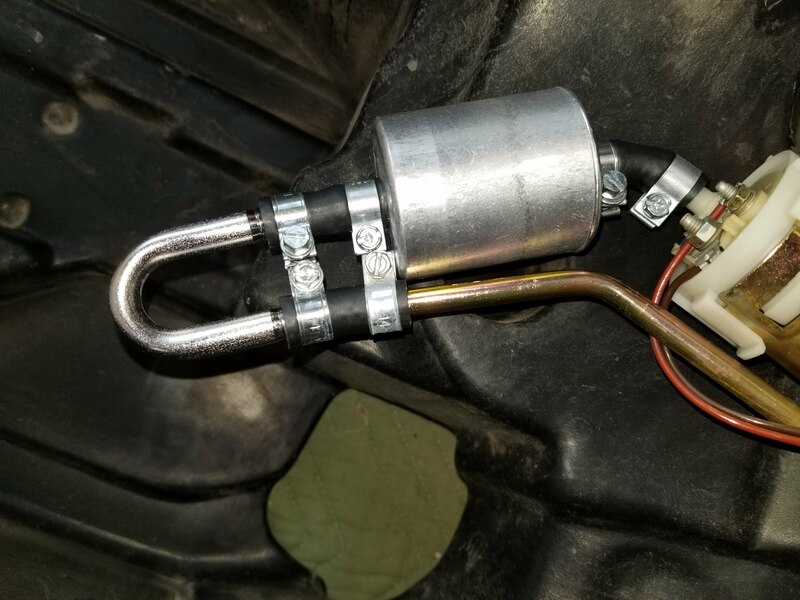 I used the first stage of the brake line flare tool to put the bulge on it. Taking care to size the bulge on the U bend with the one on the filter. 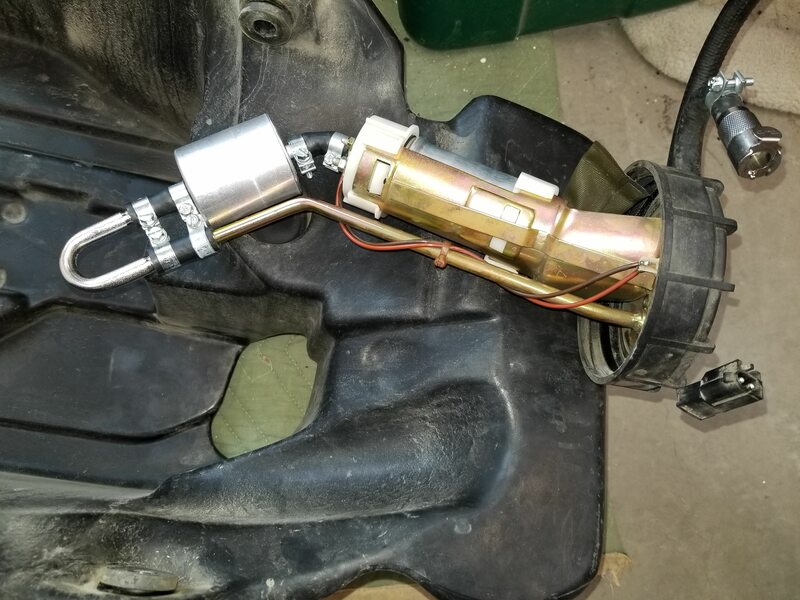 That was my first plan, but since I don’t have a flaring or beading tool, I had to buy that and then buy the brake line and it come out cheaper to just buy the SS parts preformed.